I am a Social Anthropologist with long term research experience in the former Yugoslavia, as well as in Tasmania and Switzerland. My area of special interests are anthropology of the body, anthropology of the mind, political and medical anthropology. Over the past fifteen years my work has explored various contexts where bodies – whether living, dead, or in the form of medically usable remains – become the sites of political, legal, scientific and artistic attention. Equally interested in what anthropology can contribute to understanding of the mind and consciousness, I have examined psychological and military concerns with mental health, mental hygiene and neuro-security in Serbia. My latest projects consider contemporary societal conundrums and climate of precariousness. I am examining the culture of social entrepreneurship and looking at the transformative power of imagination in engaged creative practices of envisioning the future. My doctoral work (PhD, University of Cambridge 2006) compared official, bioscientifically mediated ways of recovering bodies lost in the Yugoslav wars of 1990s with supposedly ancestral practices of repatriating the remains of aboriginal Tasmanians. This comparative account of Serbian and Tasmanian interest groups’ efforts to address past injustices through forms of bodily accounting (including the collection and DNA identification and classification of dead bodies) aimed to identify the meaning and value of human remains in postconflict, translocal, and technoscientifically oriented societies. The recovery of remains had been promoted as healing or reconciliatory, but how does it play out in practice? Case studies shed light on how dead bodies and body parts are conceived and used both as material objects and conceptual frameworks through which Serbian and Tasmanian people manage ideas of modernity, development, democracy and accountability. In tracking the circulation of remains through informal and institutionally mediated circuits, my work exposes the negotiations underlying the formulation of these concepts across a range of sites: at home, on mass grave sites, at museums, in forensic laboratories, legal offices and on the level of the communal imaginary. These locales reveal human remains conceptualized and made into the site of knowledge production, scientific ideology, moral arguments and the representation of victimhood. Broadening my research to other areas, I have also extensively investigated the British legal frameworks constituting the arena of accountability in relation to the body and body parts between 2006 to 2010. Postdoctoral research focused on interrogating the consequences of specific scientific and legal ideologies of identity and their treatment of the body as the site and evidence of truth. One interest has been the legal construction of the human remains abstracted from indigenous people in Tasmania and elsewhere and vested in British museums with a supposed potential for biomedical knowledge. In addition and for comparative purposes, in 2007 I started another ethnographic project on the Swiss artistic collective ETOY and its aspiration to ‘digitize’ human remains. This analysis of ETOY’s Mission Eternity Project describes the group’s figuration of the dead as a form of social software. The project shows how people give value not only to live bodies and (medically usable) body parts but also to corpses and dead bodily fragments, which may hold a variety of economic, political, scientific and even artistic values. In 2011 I started addressing the ongoing promotion of justice and international interventions in postconflict settings from another angle. This project applies ethnographic methods to people’s sense of global and local power relationships in specifically attending to a notion of psychological and mental security in postconflict Serbia. The research project, “Coming To Terms: On Mental Hygiene and NeuroSecurity in Contemporary Serbia”, examines specific mental security technologies in Serbia —technologies taken to safeguard the integrity not just of physical places and their borders, but also of a presumed ‘national consciousness’. The project aims ethnographically to document instances of the politicization of a presumed national consciousness at the intersection of discourses of scientific rationality, the technology of mind, parapsychological warfare, identity politics, nationalism, democracy and ideas about the future. 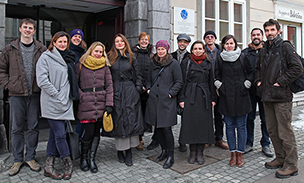 In 2014 the project was awarded with the Independent Social Research Foundation Grant. Since July 2014 I am contributing to the “Ethnographies of Land and Water Routes: A Comparative Approach to (Im)mobility” project led by dr. Nataša Gregorič Bon. I explore various modes of attending to and imagining the water resources in the Morava River valley (Serbia). In 2016 I won an ARRS (J6-7480) research grant for senior researchers for a project “Seizing the Future: A Comparative Anthropological Study of Expectations of the Future in Southeast Europe.” As the Principal Investigator I lead a team of four researchers, investigating the discourses and material practices of a range of social entrepreneurs based in Serbia, Albania and Slovenia, examining how they imagine, invoke and plan their respective futures. I have lectured and taught various subjects (the Anthropology of Europe, Anthropology of Law, Symbolic Anthropology, the Anthropology of Death, Medical Anthropology) at the University of Cambridge (UK), University of Ljubljana (Slovenia) and Chengdu University (China). I have presented my work at various conferences and as a guest lecturer at Osaka University, Birkbeck University, Yale University, Copenhagen University, University of Tasmania, Bilbao University, University College London, Edinburgh University, London School of Hygiene and Tropical Medicine and many other academic venues. Since 2016 I am teaching a course “Anthropology of Consciousness and Practices of Awareness” to the doctoral students of anthropology at the Graduate School ZRC SAZU (Ljubljana, Slovenia). PhD student Ahac Meden ‘The role of digital humanities in sharing knowledge within public scientific institutions’. 2013 Claiming the Aboriginal Body in Tasmania. An Anthropological Study of Repatriation and Redress. Ljubljana: Založba ZRC. 2011 Recasting Anthropological Knowledge: Inspiration and Social Science. Edited by Edwards Jeanette and Maja Petrović-Šteger. Cambridge: Cambridge University Press. Book manuscript: Over Our Dead Bodies: An Anthropology of Redress in Contemporary Serbia. 2016 'Passing and Healing in Contemporary Serbia: Understanding Self-care in a Postconflict Society'. In Materiality of Death and Time. Eds. Anders Emil Rassmusen, Tim FlohrSørensen and Peter Bjerregaard. 113-129. London: Routledge. 2013 ‘Marilyn Strathern’, In SAGE Encyclopedia, Theory in Social and Cultural Anthropology. Eds. R. Jon McGee in Richard L. Warms, 816-819. Los Angeles: Sage Reference. 2013 'Parasecurity and Paratime in Serbia: Neocortical Defence and National Consciousness', In Times of Security: Ethnographies of Fear, Protest and the Future. Eds. Pedersen Morten Axel and Martin Holbraad, 141-162. London Routledge. 2011 'Spools, loops and traces: on etoy encapsulation and three portraits of Marilyn Strathern', In Recasting Anthropological Knowledge: Inspirational and Social Science. Eds. Edwards Jeanette and Maja Petrović-Šteger, 145-164. Cambridge: Cambridge University Press. 2011 'Introduction: On recombinant knowledge and debts that inspire', with Edwards J., In Recasting Anthropological Knowledge: Inspiration and Social Science. Eds. Edwards Jeanette and Maja Petrović-Šteger, 1-18. Cambridge: CUP. 2009 'Anatomizing Conflict – Accommodating Human Remains' , In Social Bodies. Eds. Maryon McDonald and Lambert Helen, 47-76. London: Berghahn. 2008 Afterword: ‘O odnosnostih v antropološki vednosti’, In Pisanje Antropologije, 245-271. Ljubljana: Koda, Študentska založba. 2005 Afterword: ‘Srebreniška morišča in metini travniki: Vloga znanja in dokazov v rekonstrukciji preteklosti. In Srebrenica: dokumenti-pričevanja-haaški process. 321-333. Ljubljana: Koda. 2018 O "ODPRTEM POGLEDU" Miselne pokrajine in doživljanje časa družbenih podjetnikov in vizionarjev v današnji Srbiji. In Glasnik Slovenskega etnološkega društva, 58 (3-4): 7-23. 2017 'O ontološkem obratu in tem, kako antropologi vrednotimo in drugotimo druge in drugo'. In Glasnik Slovenskega etnološkega društva, 57 (3-4): 12-17. 2016 ' O živih in spečih vodah: antropološka analiza rabe in doživljanja vode v Srbiji' / Living and slumbering waters: Anthropological analysis of the use and perception of water in Serbia/. In Glasnik Slovenskega etnološkega društva, 56 (3-4): 75-88. 2012 'Mobile sepulchre and Interactive Formats of Memorialisation: On Funeral and Mourning Practises in Digital Art' , In Journeys, 13(2): 71-89. 2008 'Anatomizacija konflikta i telesnih ostataka kao strategija izmirenja? ', In Reč 76(22): 119-153. 2005 ‘Producing Bodies - Reproducing Persons: Thinking Human Remains in Postconflict Serbia’, In Cambridge Anthropology 2005/2006, XXV(3): 61-71. 2003 ‘The Practices of Justice and Understandings of Truth: Truth and Reconciliation Commissions’, In Eurozine. 2003 'New Reproductive Technologies and the Ideology of the Body in Slovenia', In Časopis za Kritiko Znanosti, Ljubljana, XXXI(211): 272-297. 2002 'The Body between Life and Death' [Telo med življenjem in smrtjo], In Poligrafi 7(27/28): 157- 180. 2016 ‘On (failed) resonance’, In Discovery & recognition, ISRF bulletin, issue 10: 39-47. London: Independent Social Research Foundation. 2012 ‘The Form of Remains’, In Manifesta Journal, Nr. 16, “Of Regret and Other Back Pages”. Amsterdam. 2012 ‘Tracing the Dead’, In Overgaden essays. Institute of Contemporary Art. Copenhagen. August 2012. 2010 'On Idealists_and_Realists: A Memory of Fear, Silence and the 1990s Yugoslav Wars' , In SARAI Reader 08: Fear, 123-129. New Delhi: Sarai Media Lab. B. A. in Cultural Studies at Faculty of Social Sciences, University of Ljubljana (Slovenia), 1999. MPhil in Social Anthropology, University of Cambridge (UK), 2002. PhD in Social Anthropology, University of Cambridge (UK), 2007. JRF Fellow, Peterhouse, University of Cambridge (UK), 2006–2010. Director of Studies in Archaeology and Anthropology at Peterhouse, University of Cambridge (UK), 2008–2010. Independent Scholar and a Research Associate, at the Department of Social Anthropology, University of Cambridge (UK), 2011-2013. Research Fellow, Independent Social Research Foundation, London (UK), 2014. Research Fellow and Associate Professor at the Scientific Research Centre of the Slovenian Academy of Sciences and Art, Ljubljana (Slovenia), 2014 – . Visiting Professor of Anthropology, Centre for Tibetan and Anthropological studies, Chengdu University (China), March through May 2015. Research Fellow, Morphomata, Univesity of Köln, Centre for the Advanced Studies and Humanities (Germany), September 2015 through February 2016.